There is something nostalgic about the richness of listening to an old vinyl record. Stardust Records carries an extensive collection of LPs and 45s, along with CDs and cassettes, to help you grow your own music collection. If you are hunting for a particularly rare record, we will go out of our way to try and find it for you! We can also place mail orders and special orders for out-of-stock items. Oldies aficionados will appreciate reading interviews, articles and reviews in issues of Now Dig This, a 50s rock and roll magazine from across the pond. No matter what genre of music you’re into or your music player of preference, Stardust Records has something for everyone—from avid collector to someone first exploring their musical tastes. We also buy records on a case-by-case basis. Our shop has been featured in the Hamilton Spectator numerous times over the years and we are proud to have become such a staple in our community. We welcome you to come by our shop—find us on Ottawa Street, down the block from Tim Hortons store. 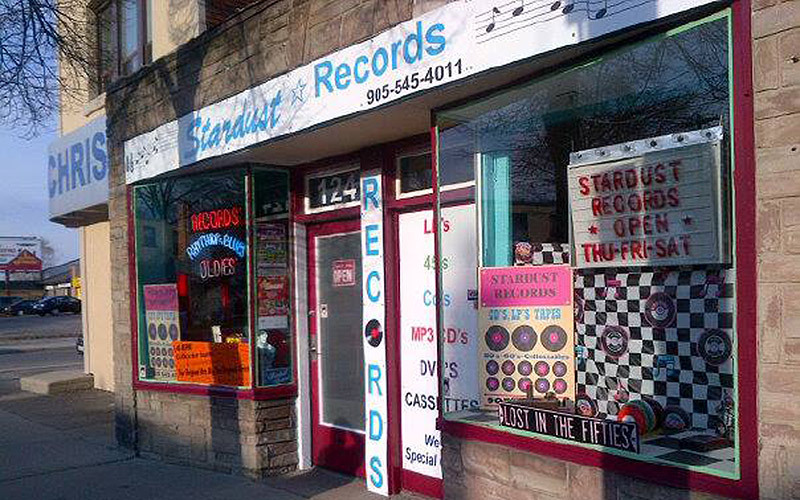 No matter what your favourite genre of music is, Stardust Records has something for you. We carry an extensive range of new and used records and CDs, including some rare collectables!